I really get excited by creating something and bringing it forward. I always found it extremely satisfactory when I did something that looked like impossible and then other people found it very valuable. Being “wired” that way becoming an entrepreneur was an obvious choice – there I could simply do what I love. In all the companies I ran, I was trying to inspire people to do what they love and get to a level they could not see being able to achieve. I relax the most when I have time to sail on the ocean or lately put all my thoughts in order and store them like a book. I very much enjoy being a world citizen, calling planet Earth home and paradise. Axel Schultze has been involved in the IT industry in various capacities. After a very fast career at Rockwell International he turned into an entrepreneur, founding and growing a number of very successful technology companies. Living almost 20 years in Silicon Valley, he was one of the very early people shaping the SaaS Industry, later the Social Media Industry. Axel Schultze is also a published author, patent holder, was named one of the globally most influential startup accelerators in 2015, won the SF Entrepreneur Award in 2008, chaired the SaaS Channel Committee at the SIIA (Software & Information Industry Association), was an early adviser of LinkedIn in 2003, one of the first executives authoring a blog, and an early beta user of Twitter. Today, Axel Schultze is founder and Chairman of the World Innovations Forum an independent Swiss based NGO envisioning equal prosperity in all nations through innovation and entrepreneurship. The organization with representation in 27 countries is embracing the concept of self-propelled economies. Prior to that he was founder of the San Francisco Accelerator, helping young entrepreneurs to grow beyond the average. Before starting the Accelerator, he founded four highly successful companies: In 2001 he was founder and CEO of Silicon Valley based BlueRoads, one of the most successful Channel Management Software companies. Here he invented a new method of multi-tier lead management and was granted patent 9514997 by the US Patent Office. In 1996 he founded and was CEO of Infinigate one of the largest IT Security provider in Europe, (today over $500 Million in revenue). In 1998 he was raising funds for the rapid growth of Infinigate and created the world’s first Equity Fundraising Platform, Webstock and sold it 2001 to one of the largest stock brokers in Europe. 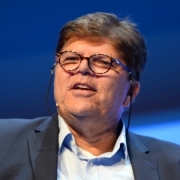 In 1983 he founded Computer 2000, the most successful European computer distributor, and third largest in the world which grew to $5 Billion in revenue and merged with TechData in 1998. I once started to traced back my family origin. After some two years I made it back to 1609. It was an interesting ride through history. The most interesting discovery was, that entrepreneurship seems to be in my DNA. My grandfather founded an aluminum manufacturing plant after he founded a leather production company. My great grandfather owned a coffee production company and his father had a wood furniture company. Also his father did something different; he owned a hotel – or what ever it was called in 1700. Going farther back was difficult enough to get names and birth dates, I found the names of the 10 or 12 children but not exactly the job they had. Family stories say, that on the 1600’s one has been the mayor from Hannover (Germany). The name Schultze = Mayor, and the horse in our family shield is actually the horse of the state of ‘Niedersachsen’. worked indirectly for Axel at BlueRoads Corp.
was with Cisco when working with Axel at BlueRoads Corp.
was an analyst at AMR research when working with Axel at BlueRoads Corp.
reported to Axel at BlueRoads Corp.
was a consultant to Axel at BlueRoads Corp.